LoneStarCon 2013 is ten days away and people are starting to post their schedules. I’ll do the same, below. Wow this looks to be amazing. So many panels and events I want to go to! Last year was my first WorldCon and it was wonderful. My friend Kelly (and her alter-ego Klagor) helped document everything by photobombing most of my pictures. Looking through them now, it’s like Where’s Waldo, but better, with surprise Kelly. 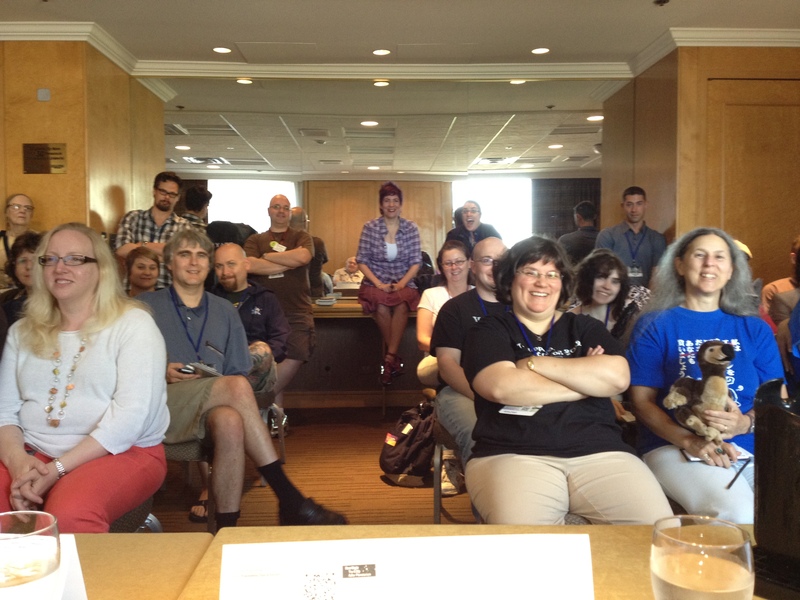 My first WorldCon panel – Food and Science Fiction – with bonus Klagor (in the back). Here’s what I’ll be up to, in addition to the Hugos, SFWA business meetings, breakfasts and dinners, and fun things. Can’t wait to see you if you go! I’ll post more updates as I have them. Woohoo! Will be something wonderful, I promise. Or monkeys. There might be monkeys. Last year, there were cookies – I’m not above bribery. From soylent green, to vat-grown protein, to descriptions of lavish meals in Game of Thrones, food is depicted in many forms in science fiction and fantasy. Our panellists discuss the role of food in world-building. There may even be recipes, although probably not for soylent green. With Chris O’Halloran, Liz Argall, Fran Wilde, & John Pitts. Of course we’re doing this at lunchtime! Bring your appetite. Impossible Futures – (Fall 2013). Edited by Tom Easton and Judith Dial, and includes cover art by Duncan Eagleson. A late-night reading from the Impossible Futures Anthology, brought to you by Jack McDevitt, Ed Lerner, and Fran Wilde. I’m delighted and honored to be teaching the writers’ workshop again with Jack McDevit. May I suggest monkeys serving cookies? Or perhaps cookies in the shape of monkeys? It sounds fabulous. Have a wonderful time! Yeah, who decided August in Texas was a good combination for a con? Thank goodness for air conditioning!